Ideal Industrial Lockout/Tagout Stations can be wall mounted or easily transported. The durable all metal, lockable cabinets come with 2 adjustable shelves for convenient storage (extra shelves available). The Station includes 2 Hinged Single-Pole Breaker Lockouts, 2 Universal Single-Pole Breaker Lockouts, 2 Cleats for Universal Single-Pole Lockouts, 2 Universal Multi-Pole Breaker Lockouts, and a 480/600V Breaker Lockout. The Station also come with 1 Cleat for 480-Volt/600-Volt Breaker Lockout, a Wall Switch Lockout, three 1 in. 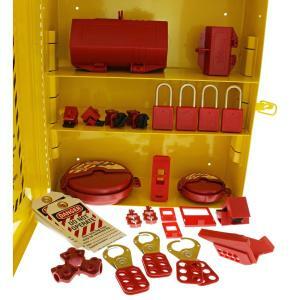 Safety Lockout Hasps, 4 Red Safety Padlocks, one 100-Volt Small Plug Lockout, one 220-Volt/550-Volt Plug Lockout, 10 Lockout Tags with Do Not Operate legend, 2 Gate Valve Lockouts, 1 Ball Valve Lockout and a Pneumatic Lockout. Tbook.com crawls the web to find the best prices and availability on Industrial Hardware and related Tools and Hardware products like Ideal Industrial Lockout/Tagout Station. For this page, related items include products we find that match the following keywords: "Industrial" at our vendor partner Home Depot. Ideal Industrial Lockout/Tagout Station is one of 143 Industrial Hardware and related products listed in the Tools and Hardware section of Tbook.com If you have any questions on this product, please give us a call at 734-971-1210 during the hours of 9am - 5pm EST for assistance. Thank you for shopping at Tbook.com, the Internet Department Store!